On Monday night, CNN released a new audio recording of Michael Brown's August 9 shooting that could potentially provide more evidence in the case: According to an independent autopsy ordered by Brown's family, the 18-year-old was shot at least six times, including twice in the head. But the audio recording, which was captured by a Ferguson resident who asked to remain anonymous, reveals that at least 10 gunshots were fired — and there was a pause between two groups of shots. 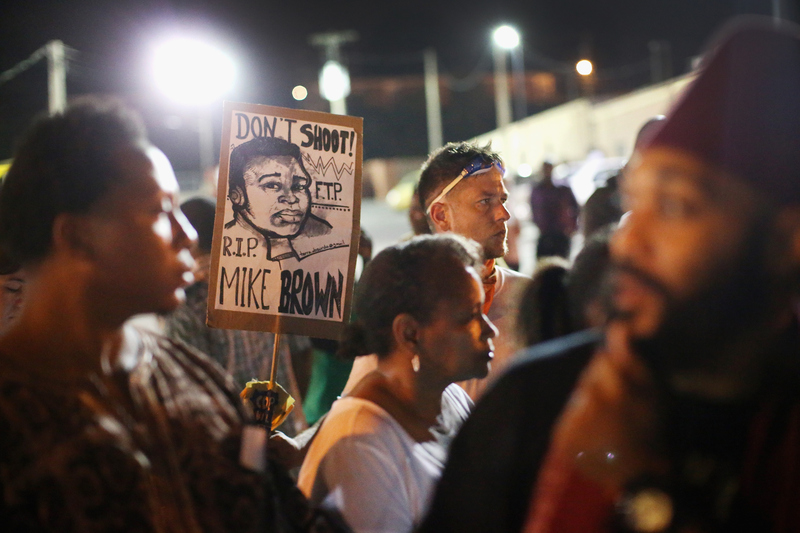 The resident was reportedly talking to his friend on a mobile chat service and already recording the conversation when he heard the shooting of the unarmed Brown by Ferguson police officer Darren Wilson. He was in his apartment, talking to a friend on a video chat. He heard loud noises ... It just happened to have captured 12 seconds of what transpired outside of his building.... I was very concerned about that pause...because it's not just the number of gunshots, it's how they're fired. And that has a huge relevance on how this case might finally end up. The audio recording is still unconfirmed, and is reportedly being investigated by the FBI. Blumenthal told CNN that her client has also been questioned by the FBI. "They're doing a thorough investigation," Blumenthal said. "They thought this would be an important piece of the investigation." Blumenthal said she heard at least 11 shots being fired on the audio recording. Meanwhile, forensic audio expert Paul Ginsberg told CNN it sounded like 10 shots — a group of six, a pause, and then four more. If the recording's validity is confirmed, the break in gunshots adds an intriguing piece of evidence to the grand jury case, which is currently gathering testimonies and evidence to decide whether or not to indict Wilson, a six-year veteran of the police force. But the pause doesn't necessarily prove intent or wrongdoing of Wilson. Attorney and Crossfire cohost Van Jones told the network there could definitely be "other explanations" for that pause. "Maybe the officer will say, 'Well, I fired, and he kept advancing, so I fired again,'" Jones said. An independent autopsy, conducted by veteran medical examiner Dr. Michael M. Baden, concluded that Brown was shot at least six times. However, only one gunshot wound — to the apex of his head — was fatal.